I’d love to have you all over to hang out in my dorm room! But since that’d be kind of difficult, I thought it’d be fun to do a room tour. First up: my side of the room. 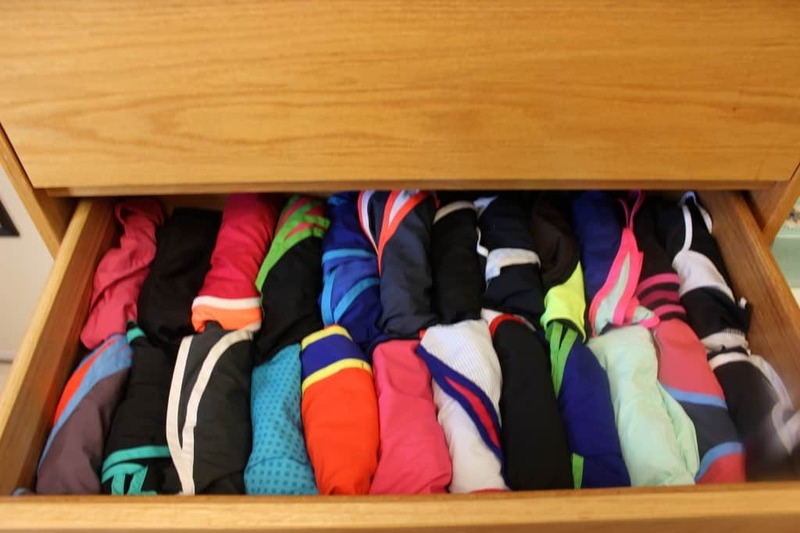 My favorite drawer– my Nike tempo shorts. I put all of them to good use! 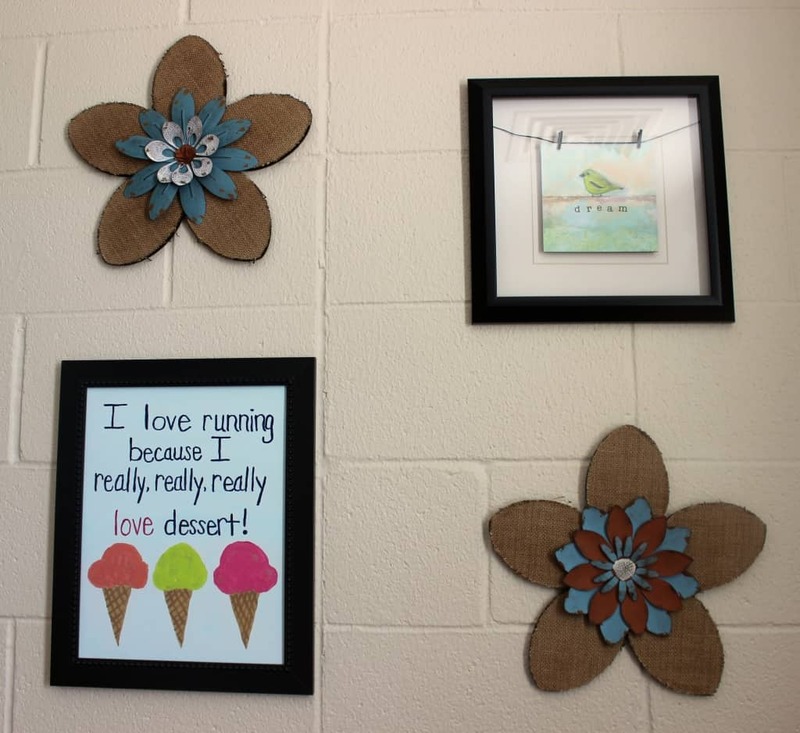 Shannon and I didn’t want our room to be matchy-matchy or look like it belonged to 8-year old twins, so we’d decided to each do our own thing instead of buying matching bedding or furniture. I picked coral, turquoise, navy, and white for my colors, and then I found out that turquoise happened to be Shannon’s favorite color! So, we ended up deciding to coordinate our two sides, with turquoise being her main color and coral being my main color, and we each incorporated elements of both colors into our individual decor. And if nothing else, it’s a whole lot better than it used to be ;). I miss the good ole dorm days, enjoy it! SO CUTE! Looks a lot like my dorm when I lived on-campus. Except yours is bigger! I’m obsessed with monograms. I like my monograms, too 😉 I try not to go too crazy with them, but I do have one on my backpack, lunchbox, planner, and wall…they’re just so cute! 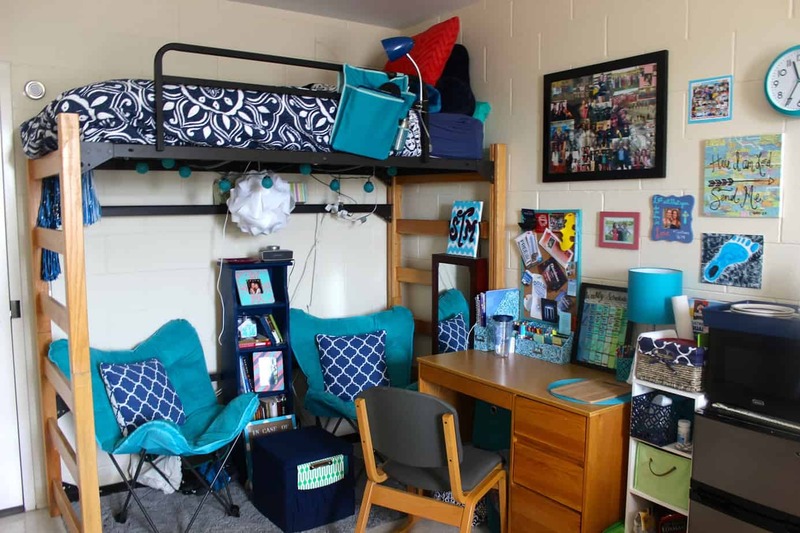 I have purposely not done a dorm tour because of how, well, it doesn’t look like yours. Haha! Thanks, Alison! 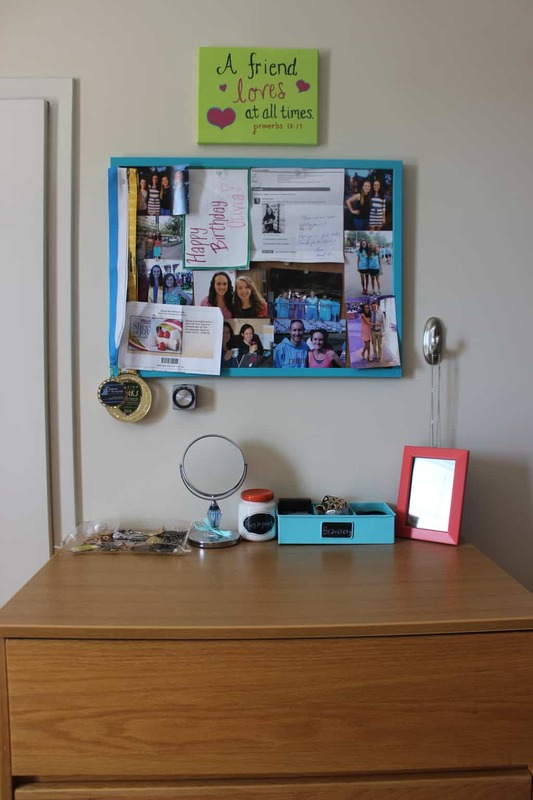 You should definitely do a dorm tour– I’d love to see yours! 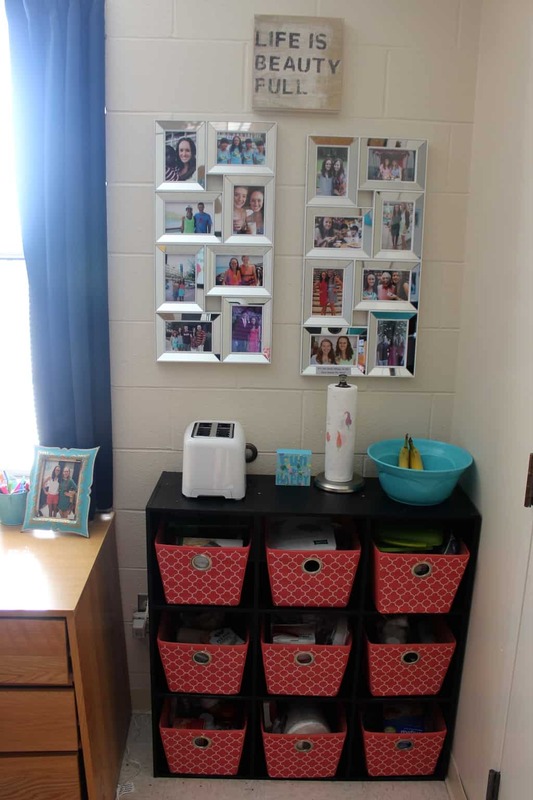 Your dorm room is so cute and I am totally jealous of your Nike tempo short drawer! I totally remember those days, and even though I didn’t like being that close to someone else stuff I sure do miss it! Love your coral organization boxes! I love Nike Tempo shorts too. You have so many! 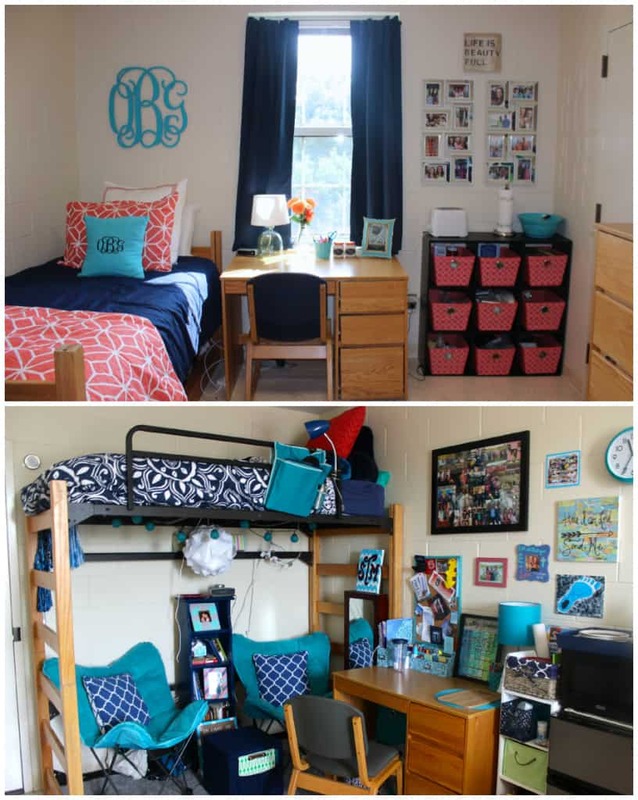 Your dorm looks similar to my old dorm. Love the organization baskets! Thanks, Christine! I love that coral and turquoise are “in” this year because I love those colors and and it made it pretty easy to find decorations in both of them! Wow! 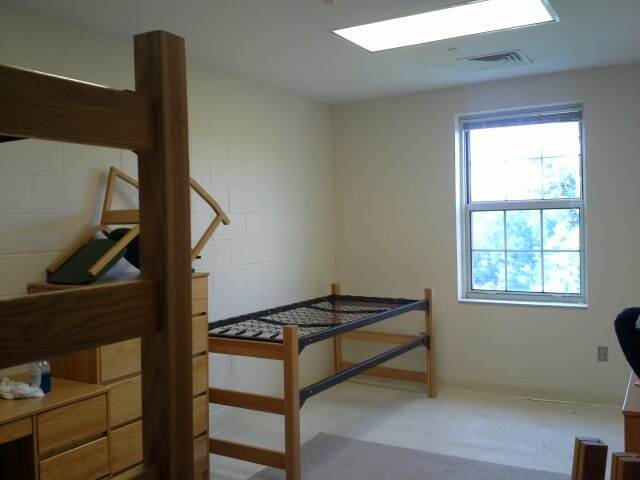 Ya’ll have a lot of room compared to my college days. Such a cute setup. I’m super jealous of how many Nike shorts you have haha! Haha! I’d LOVE to come visit Australia!! Perfect! I am from New Zealand but I just moved there so if you decorate my room I will give you a tour of down under! It’s awesome! 🙂 did you just start college? I love all the pictures, too 🙂 They’re so fun to look at and bring back so many great memories! So cute! Haha I totally thought those shelves and bins were just for random things you had until I read the caption. I love that you use it as a pantry! I love your shorts drawer! Tempos are the best! I keep all of my dishes, kitchen supplies, and foods like oatmeal and cereal in my bins! It’s kind of unconventional, but it works 🙂 Aren’t tempos awesome? 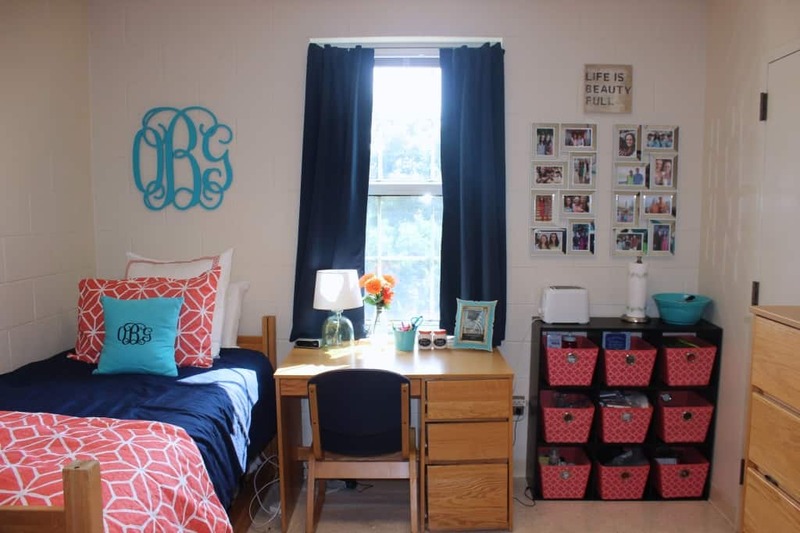 Your dorm is so cute! 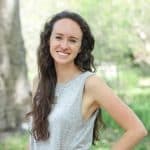 I’m going to college next year and was wondering (I am a new reader, so you may have already addressed this) if you an Shannon did a random roommate match? I’m not really sure what would be better, meeting someone online or having the school do it. Hey Christina!!! Thanks so much for commenting! Do you know where you’re going to school next year? Shannon and I actually found each other through a roommate matching website called roomsurf.com . It worked out really well because the questionnaire asked things like what time I like going to bed, how neat/organized I am, my preferences about my roommate having people spend the night, and other things that have ended up being really important when sharing a room. Shannon and I actually only live about 30 minutes away from each other, so we ended up being able to meet up a couple times before school started after we met online, but that wouldn’t be totally necessary or anything. Personally, I was a little scared to “go random” and let UNC just assign someone to me, but I know a lot of people who’ve had good experiences with that, too. Hope this helps! I’ll be going to Purdue University in Indiana! Thank you so much for the room surf tip. I have heard about it, but wasn’t sure if people had much luck with it. I will definitely be checking it out! Going random sort of scares me too haha! 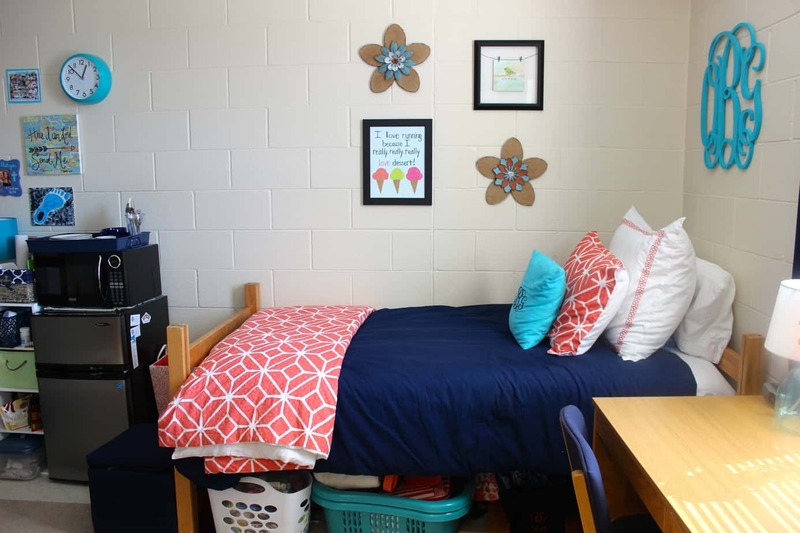 Haha I definitely did a little tidy-up before I snapped pictures, but my roommate’s side always looks that pristine 🙂 Living in a small space has definitely made me become more organized because if just a few things are out of place, our room really does look chaotic. Wish I had your Nike short collection! I need to keep my eyes peeled for them at tj max! I am absolutely in love with the coral throw and pillow case! Where did you get them? Hey Carolyn! I got them in a matching bed set at Bed, Bath, & Beyond last year. The coral throw was actually a coral bedspread and I filled the inside with a blanket so it wouldn’t be super bulky and I could fold it at the end of my bed. I remember just like its today what it really meant to living in a dorm room!